Sparked by the appearance of the Ninja 250 that got a full model change, the 250 supersport bike class has been steadily heating up. Here at Young Machine we have frequently reported about the development of the youngest brother of the Suzuki GSX-R series, the GSX-R250 equipped with a newly developed water-cooled twin-cylinder engine. On this occasion, we’ve detecting some interesting points within the newly exhibited patent. We will explain the mechanisms in detail below, but first of all we would like you to take a look at the patent diagram of the exterior body that has been publicised. 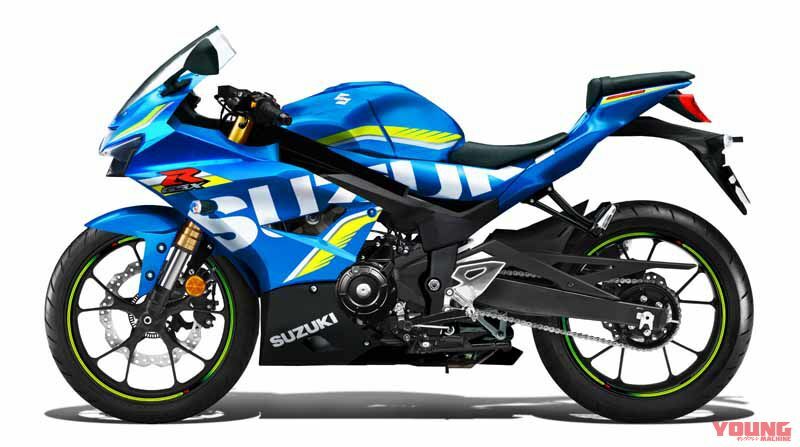 The shape which we thought the GSX-R250 (temporary name) might have, has been depicted by Suzuki. With its aggressive styling it is completely different to the already existing GSX250R that was based on the GSR250. The new design reveals the so called wedge-shape panel, an upward slanting fairing that connects from behind the low pointed-out nose. Furthermore, the distinctive tail lamp that is suspended from the seat fairing is thought to have been made to allow for easy re-modelling for production racers. 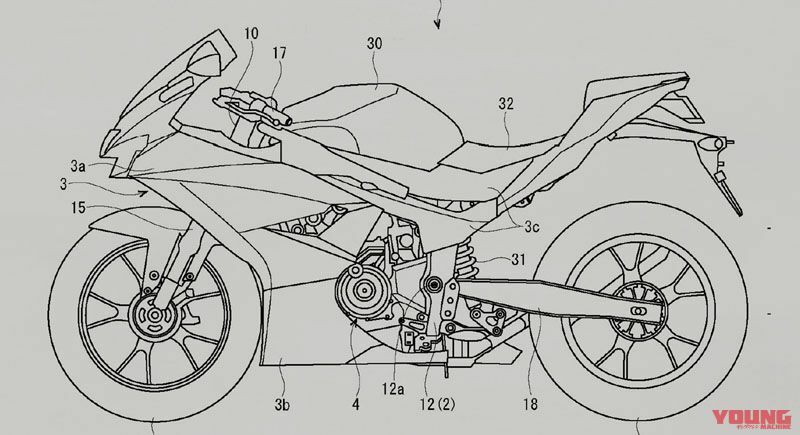 (Suzuki GSX-R250 [temporary name]) This is the patent drawing released by Suzuki. 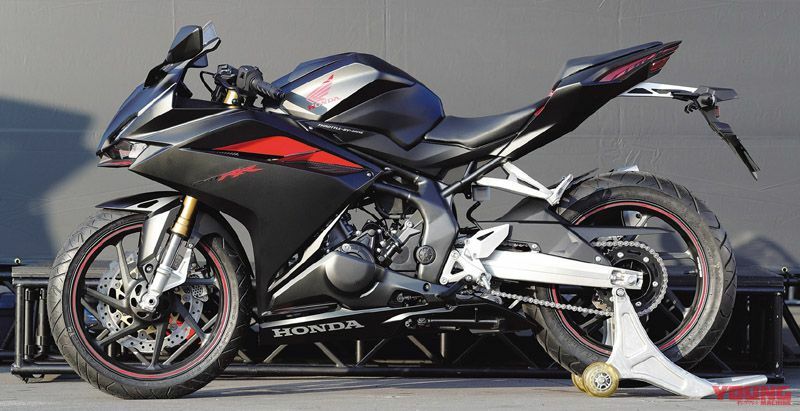 Based on the fact that the handles are positioned low, it will be a bold rival for the CBR250RR. (Honda CBR250RR) When you line them up against each other you can see how the shapes are just like one another, a considerably racey stance. The contents in the new patent that were made public show an “air cleaner arrangement construction” and “fuel piping construction”. Various illustrations have been produced in order to explain this, of which we have surveyed. This reveals the various pieces of equipment found on the GSX-R250. First of all, let’s talk about the engine. In contrast with the already existing GSX250R that has a water-cooled SOHC two-valve two-cylinder engine that focuses on long strokes though its low-intermediate gearing, the GSX-R250 adopts a DOHC four-valve design using the same water-cooled two-cylinder engine. The four-valve design has two intake and exhaust valves each respectively, and if you compare this with a two-valve version that has just one-valve each respectively, the combustion is more effective on the four-valve concept. Also, it is essential that the the camshafts provided for each of the intake and exhaust valves on the DOHC can reach high revs. On another note, please pay close attention to the fuel injector throttle bodies. On the GSX250R the air intake flows from behind horizontally, but on the GSX-R250 it adopts a downdraft flow from above and then down into the intakes. Because the intake route is straight, it means that firing inside the engine can be more effective. Also, the ram air system (mechanism that forces air into the intake) installed is recognised by AP (Asian Production) 250 race regulations, which is a great plus. (Right GSX-R250) It has been established that this is a twin-cylinder engine based on the fact there are two exhaust ports. The extended engine hangers are mounted on the lower side behind the steering head, tucked in from the left and right hand-side of the cylinder head. It is thought that this will offer high torsion rigidity. (Left GSX-R250) The frame on the YZF-R25 allows for only one section of main frame to run through, and on the CBR250RR it has two sections. The Suzuki applies the same construction as the latter, however, it has fewer pipes that lay across from the top and bottom ends than the CBR. Meanwhile, the body of the bike also draws closer to the higher spec range. Namely, the cylindrical tubes at the top and bottom that make up the twin-spar frame. The engine is mounted rigidly, and offers both lightness and torsion rigidity. 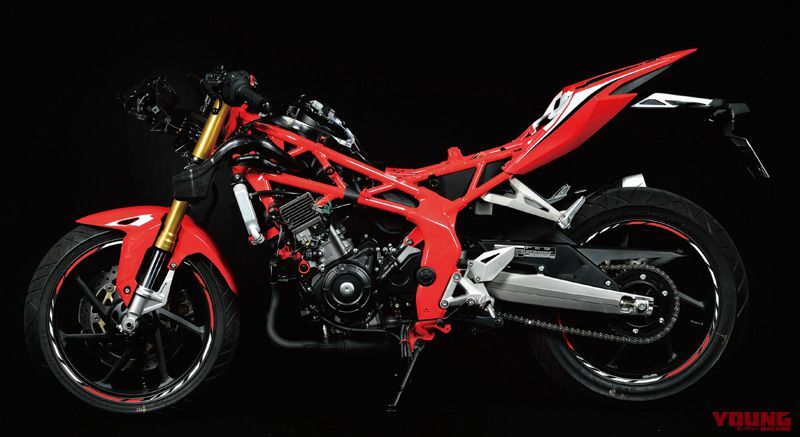 There is a linked mono shock (the GSX250R has a link-less mono system) at the rear, and USD forks (same fork design as the upright version) at the front. It appears that Suzuki are trying to make a package that will be sufficient to win in production races. Furthermore, judging from the form of the USD forks, there is no mistake in believing the brakes will be the radial mounted style. This is something worth shouting about as it exceeds the ordinary brakes found on the CBR250RR. Of course, it is likely to be equipped with ABS too. (CBR250RR) Due to the two pipes that lay across the top and bottom, it offers a steel trellis frame that guarantees the rigidity of a standard aluminium frame. In addition, this allows for a higher level of balance in both rigidity and lightness. (Right GSX-R250) It’s hard to see in these illustrations, but in other illustrations there are pulleys drawn on the side of the throttle body. This is to say that it is cable operated. (Left CBR250RR) An electronic control throttle is in use, so it implements a fine feeling in acceleration. It is possible to choose from three kinds of riding mode settings. In the patent put on display the details of mechanisms throughout the GSX-R250 have been brought to light. However, there is also the rumour that Suzuki have one more new style of 250 in the making, an oil-cooled single-cylinder Gixxer 250 (temporary name). The details regarding this machine can be found in the May edition, but we will introduce it here one more time. The engine has a “recycling oil-cooled system” that implements passages for oil to cool down in the vicinity of the combustion chamber, and creates oil jackets in-between the intake & exhaust ports. If you compare it with the first generation GSX-R750 that first began with this traditional oil-cooled system, the new style allows for a higher speed of oil circulation, and despite being a simple design it achieves a high rate of cooling effect. As a result, it is possible to create an engine that is not only high in performance, but also light. (Suzuki GSX-R250 [temporary name]. Expected time of arrival: TBA. 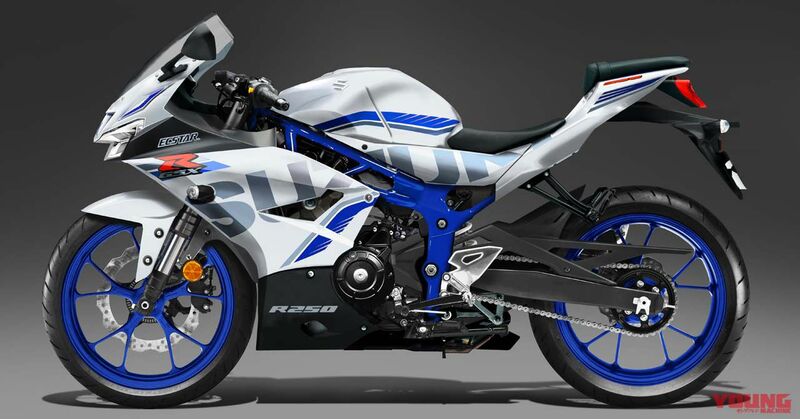 Possibility of debut: 5%) Based on the drawings in the patent that have been published, the GSX-R series graphics have been filled in to complete this CG image. (Suzuki Gixxer 250 [temporary name]). Expected time of arrival: Autumn 2018. Possibility of debut: 50%.) 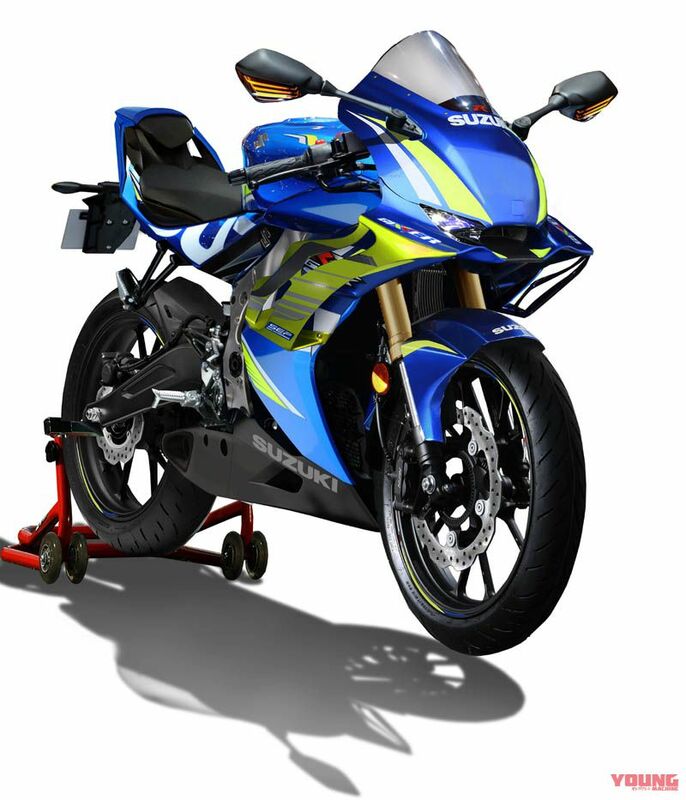 There is one more new style of 250 sport bike rumoured, an oil-cooled single-cylinder sports Gixxer (temporary name). For more details, click here.